Frilled Neck Lizards are a unique reptile found mostly in the tropical Northern half of Australia and parts of Papua New Guinea. When they are feeling frightened or defensive they puff out the frill around their neck, earning them their name. I don’t think I have ever been lucky enough to spot one of these creatures in it’s natural habitat in the wild, but one day I would like to. They are so cute! 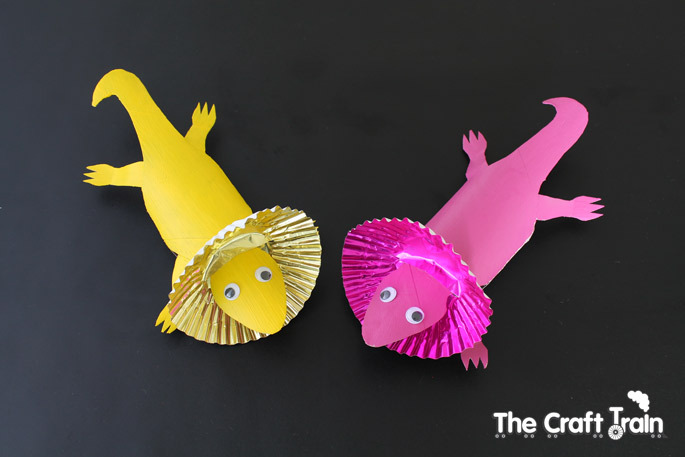 We decided to make some Frilled Neck Lizards from cardboard tubes to celebrate Australia Day, which is next Monday 26th January. You can make one too, they are easy! 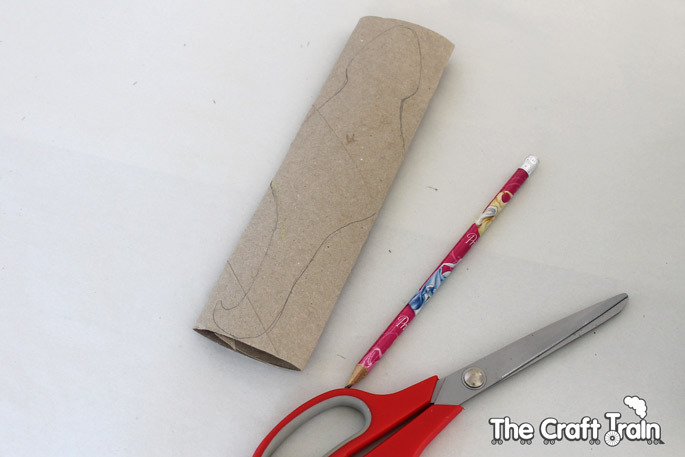 First, squash your cardboard tube completely flat. Then sketch a lizard head and tail shape on there like in this picture. 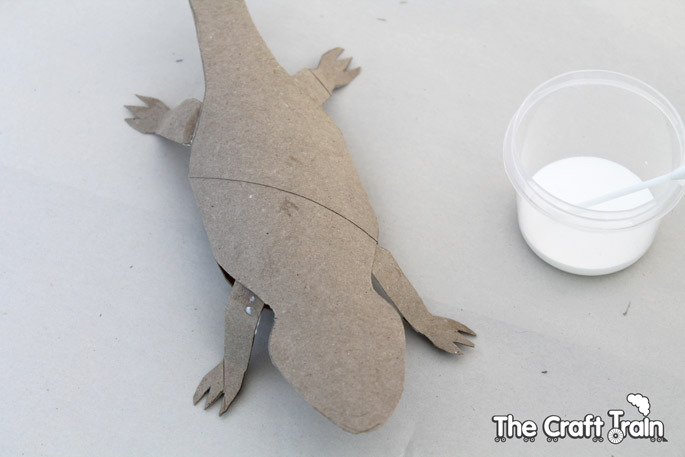 For the body of the lizard leave the cardboard tube joined at the edges. Cut along the lines you have sketched. If you need some help getting the shapes right you can use this Lizard Template. 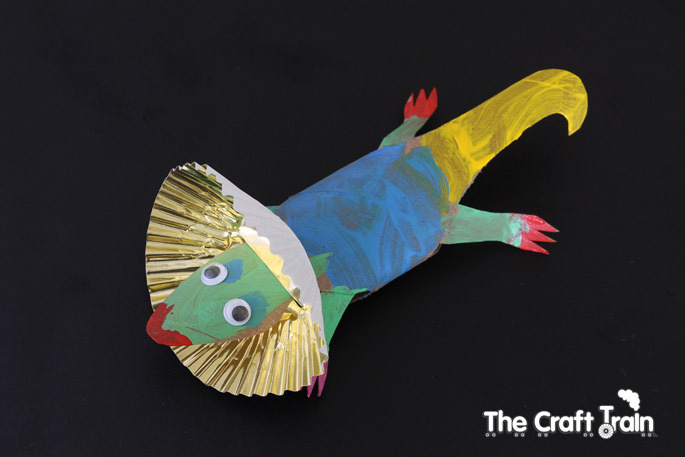 Flip the lizard over, and cut off the head and tail shapes on the bottom, so you only have them on the top. 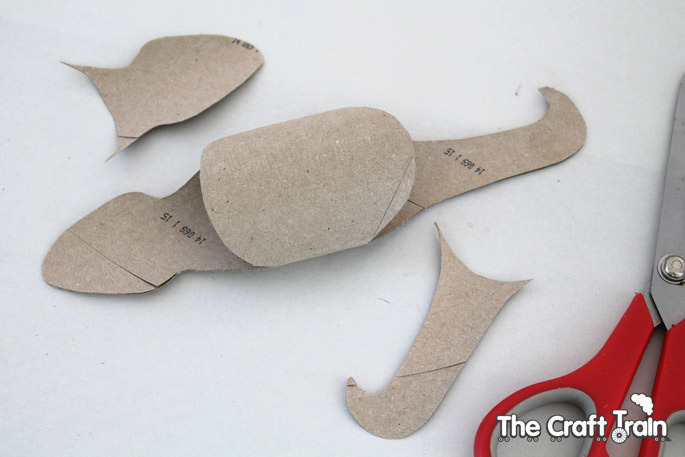 Cut out four leg shapes. 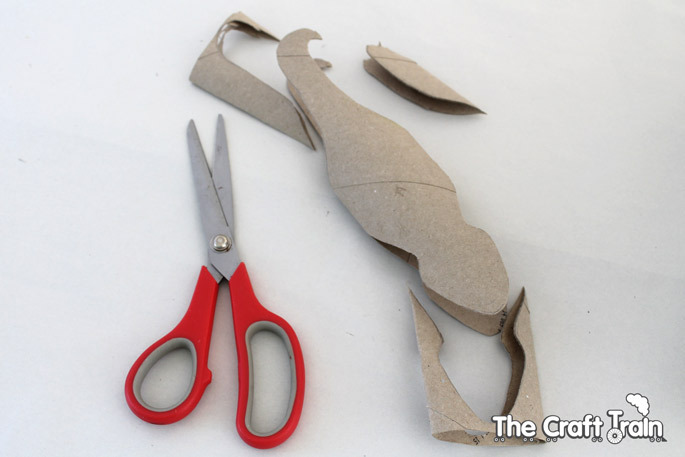 I had enough scrap cardboard left over from cutting around the lizard to use as the legs, but if your roll is a bit narrower than mine you might not have enough and will need to use a second cardboard tube or other pice of suitable cardboard (like a piece of cereal box, or some heavy construction paper). 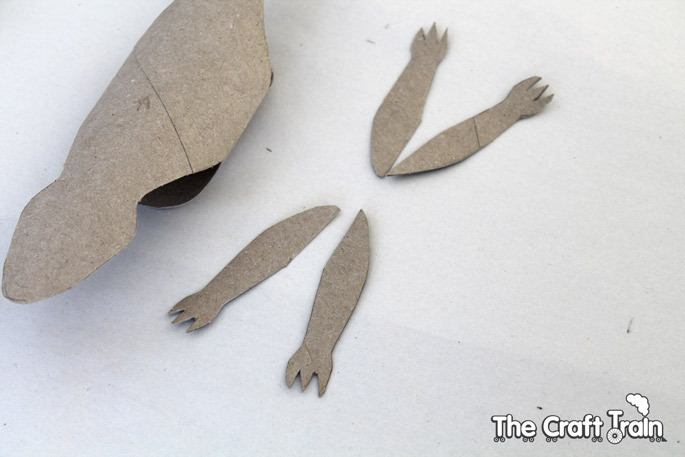 Glue the legs on, bending them into shape so that the feet touch the ground. You are now ready to paint your lizard. Generally these lizards are a reddish/brownish/yellowish colour but why limit yourself to that? Go on, make a rainbow one, Miss K did. 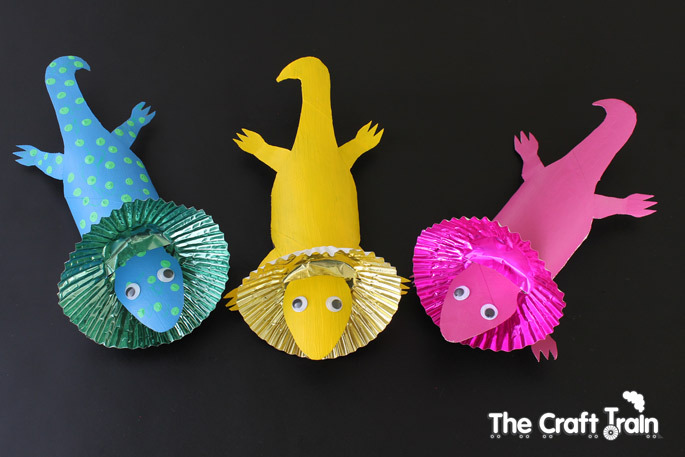 Once your Lizard has been painted, give it time to dry before glueing on the googly eyes, and then cut a slit in your cupcake case and glue that onto the neck last of all, puffing it up around it’s head and just putting a small amount of glue at the base. This rainbow one was painted by Miss K, I cut it out and made the shape for her. Wishing you all a fabulous Australia Day next week! So clever! And they turned out so well! I wouldn’t mind spotting one of these colourful and friendly looking lizards on some of our bushwalks. 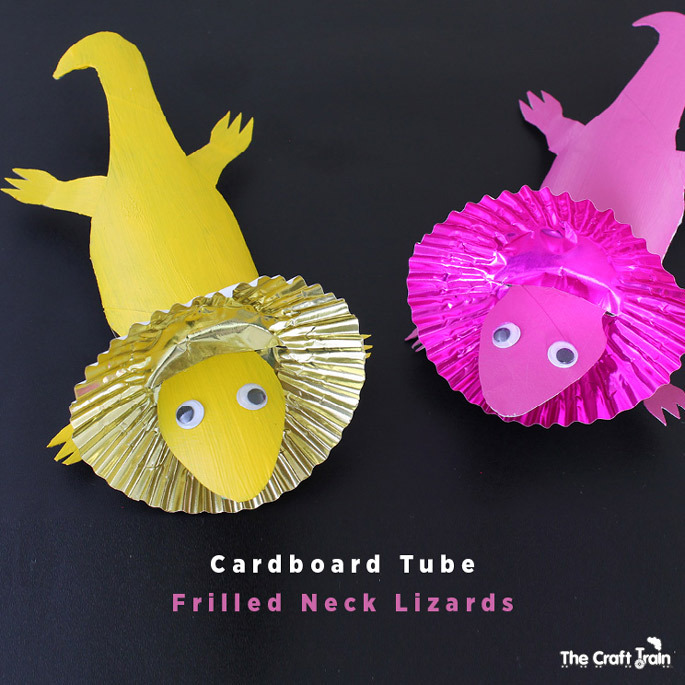 This is such a creative use of cardboard tubes and they turned out so well.